A lack of big data to learn from is one of the reasons holding back the full launch of Bixby, according to a new report. Samsung's smart digital assistant still hasn't appeared on the Galaxy S8 and Galaxy S8 Plus outside of South Korea, though the phones themselves went on sale worldwide in April. Last month a Bixby preview trial was opened to a selected number of users in the US, apparently to do some real-world testing. Now The Korea Herald says the ongoing delays are because Bixby just doesn't have enough sample data to power its algorithms, something we've heard hints about before. "Developing Bixby in other languages is taking more time than we expected mainly because of the lack of the accumulation of big data," a Samsung spokesperson told the Herald. Communication problems between Samsung's US and Korean teams is another reason for the hold-up, according to the report. The deep learning technology behind Bixby and other smart assistants is designed to help AI apps recognise commands and act on them - but these clever bots need a lot of sample data to start with, which isn't easy when you've only got a small number of English-speaking users actually testing the system. Samsung has already missed some self-imposed deadlines for launching Bixby outside of South Korea and it looks like we're going to be waiting a while yet. In the meantime, you could always use Google Assistant instead. 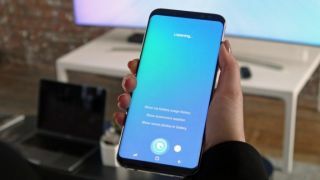 Only when it's got Bixby's big data problems ironed out can Samsung hope to put the assistant app into smart speakers and other devices - apparently a speaker codenamed Vega is on the way, but it won't be much use without Bixby inside. Let's hope Samsung gets its hands on some more data quickly.